"THE EXPERIENCE OF THE 1950S SHOWS NO DEAL CAN BE BETTER THAN A BAD DEAL"
"NO DEAL IS A GENTLE SLOPE NOT A CLIFF EDGE"
"12 THINGS THE PM NEEDS TO SAY TO MPS TONIGHT"
"THE BREXIT EXPERIENCE SHOWS WE CANNOT BLINDLY TRUST CIVIL SERVANTS"
"ONLY WITH NO DEAL CAN WE ESCAPE THE EU RULES FACTORY"
"BREXIT SHOULDN'T SILENCE VOICES AGAINST ENDEMIC EU WASTE"
"THE IRISH BACKSTOP ISN'T THE ONLY PROBLEM WITH THE BREXIT DEAL"
"THE MAN WHO SAYS BLOWING THE WHISTLE ON ALLEGED EU 'FRAUD' COST HIM HIS JOB"
"PLAN BOLES FALLS AT THE FIRST HURDLE"
"THE EEA IS THE WRONG ROUTE"
"PREPARING FOR NO DEAL DOES NOT MEAN THE SKY IS ABOUT TO FALL IN"
​"A SPECIAL PLACE IN HELL"
"DONALD TUSK REMINDED US THE EU IS ANTI-DEMOCRATIC"
"THE BACKSTOP'S NOT THE ONLY DANGER IN MAY'S DEAL"
"FROM THE NORSE'S MOUTH - WHY NORWAY IS NOT AN OPTION"
"BREXIT BRITAIN: THE RISE AND FALL OF BRITAIN?" "THERESA MAY'S BREXIT DEAL POSES A RISK TO THE UK DEFENCE INDUSTRY"
"EU TO KILL OFF 'MEN'"
"EU PARLIAMENT SENDS MPS NEW GENDER NEUTRAL GUIDEBOOK"
"POLITICALLY CORRECT EUROPEAN PARLIAMENT URGES END TO WORDS LIKE 'MAN-MADE', MANKIND', AND 'LAYMAN'"
"NOW THAT'S WHAT I CALL BREXIT: OUR GREATEST HITS IN 2018"
"REASONS TO BE FEARFUL ABOUT REJIGGING THE BACKSTOP"
"A BONANZA FOR THE GAMING INDUSTRY DURING CHRISTMAS"
"THE BREXIT LEGAL ADVICE CONFIRMS LEAVERS' WORST FEARS"
"THE MISTAKES THAT LED TO BREXIT"
"SPAIN'S BREXIT THREATS ARE AS SHALLOW AS THEY ARE FUTILE"
"FIRST IMPRESSIONS OF THE POLITICAL DECLARATION"
"AMBER RUDD IS WRONG TO ASSUME THAT PARLIAMENT WOULD LEAP IN"
"THE GREATEST PROBLEM WITH THE BREXIT DEAL? IT LEAVES US WITH THE PROSPECT OF GREATER LIMBO"
​"THERE ARE SOME NASTY SURPRISES IN THE SMALL PRINT OF THERESA MAY'S BREXIT DEAL"
"WHY BREXITEERS SHOULD WRITE OFF THE IDEA OF 'NORWAY FOR NOW'"
"TORY MEPS LAUGH ABOUT PLAYING BREXIT GAMES"
"NOW THE EU-WORDS POLICE BAN MANKIND AND MANPOWER IN GENDER 'NONSENSE'"
"EU INFLEXIBILITY IN THE BREXIT NEGOTIATIONS"
"THE EU IS AN ANTI-EUROPEAN FORCE: IT MUST BECOME A 'COMMUNITY OF SPIRIT'"
"EU SEE BREXIT AS A THREAT"
"'IT'S NONSENSE!' EXPERT OUTLINES BRILLIANT REASON WHY NO DEAL IS BEST OPTION FOR BRITAIN"
"BREXIT, A FANTASTIC HOPE FOR FRANCE"
"WHY THE SWISS AREN'T HOT ON THE EU EITHER"
"THE EUROPEAN COMMISSION'S NEGOTIATING MINDSET IS DICTATED BY EMOTIONS RATHER THAN PRAGMATIC POLITICS"
"BRUSSELS THREATENS TO STRIP BRITAIN OF £4BN REBATE IF SECOND REFERENDUM 'OVERTURNS BREXIT VOTE'"
"BREXIT BETRAYAL: BRITAIN TO HAND BILLIONS TO BRUSSELS UNDER CUSTOMS UNION PLOT"
"WHAT'S THE POINT OF BREXIT IF WE'RE SHACKLED TO A CUSTOMS UNION?" "MY UNEXPECTED CONTINENTAL ADVENTURES ON THE ROAD OUT OF THE EUROPEAN UNION"
"EU LEADERS SEE BREXIT AS A THREAT"
​"THE NORWAY OPTION WOULD BE EVEN WORSE THAN CHEQUERS"
"THE GOVERNMENT HAS IGNORED THE BASIC PRINCIPLES OF SUCCESSFUL NEGOTIATION IN ITS DEALINGS WITH BRUSSELS"
​"ICELAND CAN TEACH US IMPORTANT LESSONS ABOUT BREXIT"
"JUST WHAT IS SO WRONG WITH THE PM'S CHEQUERS PLAN?" "WE DANES SHOULD LEAVE THE EU ALONG WITH YOU"
​"THE SCALLOP WARS: FURY IN THE CHANNEL"
"VI KAN FÅ BREXIT UTAN AVTALE TIL Å FUNGERE"
"WHY BREXIT MAKES AN IRISH DEPARTURE FROM THE EU MORE LIKELY"
"HERE IN NORWAY, WE CAN DO MUCH BETTER THAN THE EEA. AND SO CAN YOU IN BRITAIN WHEN YOU QUIT THE EU." "THE SCALLOP WARS ARE A SHOT ACROSS THE BOW OF BREXIT BRITAIN"
"WE CAN MAKE WTO TERMS WORK TO BRITAIN'S ADVANTAGE. HERE'S HOW"
"THE UK'S NO DEAL PLANS WILL STRENGTHEN ITS NEGOTIATING HAND"
"NEW BREXIT BOARD GAME LETS PLAYERS TAKE OVER TALKS WITH BRUSSELS"
"BRITAIN'S FURTIVE DEFENCE INTEGRATION WITH THE EU"
"LESSONS FOR BREXIT FROM THE HANSEATIC LEAGUE"
"WE NEED TO GET REAL ON A NO DEAL"
"WHEN IT COMES TO 'IMPARTIAL' ADVICE ON SECURITY, THE EU GETS WHAT IT PAYS FOR"
"BEWARE THE OUTPUT OF DEFENCE AND SECURITY THINK TANKS FUNDED BY THE EUROPEAN COMMISSION"
"MEMBERSHIP IF THE EEA IS NOT THE ANSWER TO BREXIT"
"EEA MEMBERSHIP DOES NOT SOLVE BRITAIN'S BREXIT DILEMMA"
"THERESA MAY SHOULD KEEP DAVID DAVIS'S DRAFT WHITE PAPER IN HER BACK POCKET"
"NAYSAYERS OF THE BREXIT APOCALYPSE"
"HOW WE CAN CLIMB OUT OF THE BREXIT MIRE"
"BRITAIN SIGNS UP TO MACRON MILITARY PACT"
"BREXIT APOCALYPSE NOW? 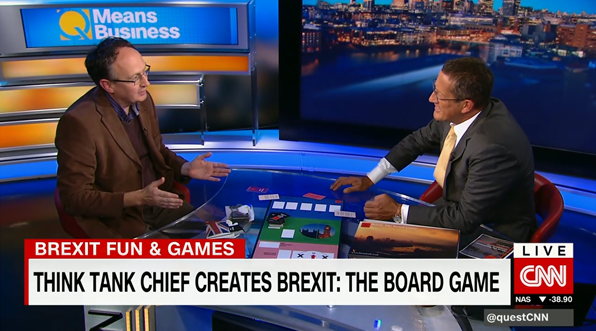 ER, NO"
"INTRODUCING ... BREXIT: THE BOARD GAME"
"EUROCRAT CORRUPTION, BRAWLS AND BULLYING EXPOSED"
"NOTHING COULD BE LESS CENTRAL TO THE BREXIT DEBATE THAN THE LIB DEMS RIGHT NOW"
"MAXFAC BORDER SOLUTIONS OPERATE IN A COUNTRY LIKE RWANDA, SO THEY CAN WORK FOR THE IRISH BORDER TOO"
"BRITAIN SHOULD NOT BE TAKEN IN BY THE EEA OPTION – ITS EXISTING MEMBERS INCREASINGLY WANT TO LEAVE"
"ARE THE PRO-CUSTOMS UNION 'BACTIVISTS' TRYING TO DISTRACT US?" "EL MUSEO DEL BREXIT: EL NUEVO SUEÑO DE LOS EUROESCÉPTICOS BRITÁNICOS"
"THE EU BELIEVES IT CAN PUSH BRITAIN AROUND OVER NORTHERN IRELAND. THEY DON'T KNOW BRITAIN"
"LET'S EMBALM NIGEL FARAGE AND PUT HIM IN THE NEW 'MUSEUM OF BREXIT, SAYS CABINET MINISTER LIZ TRUSS"
"NEW 'BREXIT MUSEUM' COULD BE BUILT IN LINCOLN"
"A FLICKER OF LIGHT IN THE BREXIT TUNNEL?" "ON EN PARLE À LONDRES : UN MUSÉE DU BREXIT POURRAIT OUVRIR DANS « DEUX OU TROIS ANS » AU ROYAUME-UNI"
"DIE BRITEN PLANEN BEREITS EIN BREXIT-MUSEUM"
"A BREXIT MUSEUM? THE NORTH EAST COULD BECOME HOME TO IT, SAY CAMPAIGN ORGANISERS"
"'BRING IT ON!' BREXITEERS EMBRACE EXCELLENT IDEA FOR BREXIT MUSEUM IN THIS PRO-LEAVE CITY"
"IT'S TIME TO PRESERVE THE STORY OF THE DECADES-LONG CAMPAIGN FOR BRITISH INDEPENDENCE FROM BRUSSELS"
"EUROSCEPTIC CAMPAIGNERS HAVE LAUNCHED PLAN FOR A BREXIT MUSEUM"
"BREXITEERS SEEK CAMPAIGN MEMORABILIA FOR A 'MUSEUM OF SOVEREIGNTY'"
"MUSEUM OF BREXIT IS ANNOUNCED"
"MUSEUM OF BREXIT, 'CENTRE OF EUROPEAN DISINTEGRATION STUDIES' TO LAUNCH, COLLECTING ARTEFACTS"
"FORMER LEAVE FIGURES PLOT MUSEUM OF BREXIT"
"BREXIT 'MUSEUM OF SOVEREIGNTY' TO TELL STORY OF LEAVING THE EU"
"EUROSCEPTICS ANNOUNCE PLAN FOR BREXIT MUSEUM TO CHAMPION HERO CAMPAIGNERS"
"MUSEUM FOR THOSE WHO NEVER TIRE OF BREXIT"
"CAMPAIGNERS ARE TRYING TO CREATE A BREXIT MUSEUM: HERE'S WHAT WILL BE IN IT"
"THE UNDERSTANDABLE ANGER OF BRITISH FISHERMEN"
"A TRIBUTE TO SIR RICHARD BODY"
"IGNORE BRUSSELS' BLUSTER ABOUT THE IRISH BORDER"
"AS WE TAKE BACK CONTROL OF OUR FISHING WATERS, MINISTERS MUST PROVIDE THE RESOURCES TO POLICE OUR SEAS"
"KEEP THE EU AWAY FROM THE IRISH BORDER"
"CAMPAIGNERS TO STOP BREXIT PREPARE 6-WEEK ADVERTISING BLITZ"
​"WHITEHALL NEEDS A BREXIT MISSION STATEMENT"
"'THE EU IS A RULES-BASED ORGANISATION.' OH, REALLY? CONSIDER THESE TEN EXAMPLES TO THE CONTRARY. AND THERE'S MORE"
"BREXITEERS ARE RIGHT TO FIGHT TO GET BRITAIN OUT OF THE CUSTOMS UNION. HERE'S WHY"
"BRITAIN MIGHT WANT TO RECONSIDER JOINING EFTA - BUT SHOULD STAY CLEAR OF THE EEA"
"WE'LL SOON BE PICKING UP THE REAL BILL FOR BREXIT"
"THE QUIRKS OF TRADE DIPLOMACY"
"THE 42 DEALS SHOWING UK WON'T HAVE TO COPY NORWAY AFTER BREXIT"
"THE 42 DIFFERENT TYPES OF TRADE RELATIONSHIP WITH THE EU (SO FAR)"
"BRITISH BUREAUCRATS MUST 'KICK ADDICTION' TO BRUSSELS RED TAPE AFTER BREXIT"
"YES, CANADA PLUS IS A REAL POSSIBILITY - AND THE EU'S OWN HISTORY OF TRADE PROVES IT"
"HOW WILL THE EU FILL THE BLACK HOLE IN ITS BUDGET AFTER BREXIT?" "GOVERNMENT 'AUSTERITY' IS A JOKE - OUR NATIONAL DEBT IS NOT"
"BRETAR VILJA FREKAR ENGAN SAMNING EN SLAEMAN"
"CIVIL SERVICE DISSIDENTS MUST ROUT THE REMAINERS"
"BRET­AR FARA ÚT MEÐ EÐA ÁN SAMNINGS"
"BRETAR FARA ÚT MEÐ EÐA ÁN SAMNINGS"
"THE UK SHOULD CAREFULLY CONSIDER WHAT IS WORTH SACRIFICING FOR A TRADE DEAL WITH A DECLINING MARKET"
"FOLKEBEVÆGELSEN MOD EU HAR UDDELT TRÆSKOPRISER"
"INTERNATIONAL TRÆSKOPRIS GÅR TIL DET BRITISKE FOLK"
"HOW CAN THESE EUROPE-LOVING LECTURERS EVER BE IMPARTIAL?" "THE 'DEAL OR NO DEAL' DEBATE IS A FALSE DICHOTOMY"
"THE TIME HAS NOT YET COME - AND MAY NOT DO SO AT ALL - TO BREAK OFF THE BREXIT TALKS"
"WE HAVE A DUTY OF CARE TO EU WHISTLEBLOWERS"
"THE EU WOULD STILL RATHER HUSH UP FRAUD THAN PUNISH IT"
"EU ‘WILL WANT VENGEANCE ON BREXIT BRITAIN’, SAYS WHISTLEBLOWER"
"UK HAS COMMITTED 'CARDINAL SIN': 'VENGEFUL' EU WILL PUNISH FOR BREXIT – WHISTLEBLOWER"
"BRUSSELS WILL WANT VENGEANCE ON BREXIT BRITAIN, WARNS WHISTLEBLOWER WHO EXPOSED EU FAILINGS"
​"BEWARE A BREXIT THAT MAKES US LESS SECURE"
"DON'T BELIEVE THE BREXIT HYSTERIA"
"OUT OF IDEAS AND DESPERATE TO SUPPRESS DISSENT, THE EU'S DAYS ARE NUMBERED"
"HOW TO UNCOUPLE OURSELVES FROM THE EU'S QUANGOCRACY"
"THE DETAILS OF BREXIT ARE LARGELY DULL, NOT DIFFICULT"
"WE MUST DISENTANGLE BRITAIN FROM EU QUANGOS"
"THE LATEST SPECULATION ABOUT A 'NO DEAL' BREXIT FAILS EVEN TO PROPERLY DEFINE THE SCENARIO"
"THE UK WILL SOON LEARN THAT BEING A SOVEREIGN COUNTRY ALLOWS YOU TO SUCCESSFULLY MANAGE YOUR FISHING INDUSTRY." "WILL THE GOVERNMENT ENSURE THAT BREXIT IS THE FISHERMAN'S FRIEND?" "THE EUROPEAN COMMISSION IS STILL TRYING TO SHIELD ITS SINNERS." ​"BEHAVIOUR REPORT SHEDS LIGHT ON OFFICE ANTICS OF EU BUREAUCRATS." ​"WHAT WOULD WTO MEAN? NAVIGATING TARIFFS AND RULES OF ORIGIN." "WHAT WOULD WTO MEAN? IT WOULD BE A WALK TO A BEACH, NOT A CLIFF-EDGE DROP TO DESTRUCTION"
"LABOUR CAN'T BOTH CLING TO ITS EU POLICY AND NATIONALISE THE RAILWAYS TOO." "THE EU'S LACK OF SUPPORT FOR NATO COULD UNDERMINE EUROPEAN SECURITY"
"THE PLAN FOR A NEW EU CONSTITUTION PROVES BRITAIN IS RIGHT TO GET OUT NOW"
"BRITAIN IS RIGHT TO REJECT EEA MEMBERSHIP: AS AN ICELANDER, I SHOULD KNOW"
"50 GROUPS BEHIND ARTICLE 50 - PART II"
"50 GROUPS BEHIND ARTICLE 50 - PART I"
"VETERANS DEMAND BREXIT FOR DEFENCE"
"ANTHONY COUGHLAN: WHY BREXIT SHOULD BE ACCOMPANIED BY IREXIT"
"KEEP OUTSIDE THE EEA: DEBUNKING THE MYTHS ABOUT THE 'NORWAY OPTION'"
"DEAR BRITAIN, DON'T MAKE THE SAME MISTAKE NORWAY DID"
"WHAT COULD THE EU HAVE LEARNT FROM NORTH AMERICA ABOUT FEDERALISM AND SOVEREIGNTY?" "IF THE UK HAS BEEN GOLD-PLATING EU RULES, CONSIDER THAT THE EU HAS ALREADY BEEN SILVER-PLATING INTERNATIONAL STANDARDS"
"BY THE EUROPEAN COMMISSION’S ADMISSION, THE EU HAS ALREADY ENTERED INTO 42 DIFFERENT TYPES OF TRADE DEAL"
"CHANGE, OR GO DISPELS THE PERNICIOUS MYTH THAT NO WORK HAS BEEN DONE ON BREXIT"
"THE MISSED OPPORTUNITIES THAT LED TO BREXIT"
"IT'S TIME TO ESTABLISH WHAT KIND OF RELATIONSHIP WITH THE EU WILL BE IN THE NATIONAL BEST INTEREST"
"SOME REFLECTIONS ON THE ARTICLE 50 RULING"
"HARD VS SOFT BREXIT IS A FALLACY"
"HOW THE INSIDIOUS EU PROPAGANDA MACHINE HAS COST US MILLIONS"
"IN PRAISE OF CHARLES MACKAY"
"MAKING SENSE OF ARTICLE 50 – AND WHY WE ARE RIGHT NOT TO BE TRIGGERING IT IMMEDIATELY"